Orphaned Stray Puppy Adopted By A Caring Monkey…Stories of love, friendship and compassion don’t have any predefined form. Not everything needs to be customary or in the natural scheme of things. There are rather surprising tales from every nook and corner of the world which compel us to believe in the good, or bad at times. We have all heard stories of stray dogs being adopted and saved from dangerous situations, we have seen people rescuing homeless and orphaned dogs, we have heard of dogs taking care of puppies that are not their own. What we haven’t heard or seen is a monkey adopting a puppy. 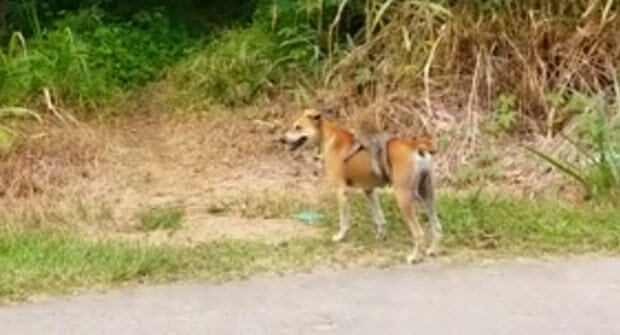 In an Indian town, a monkey has been spotted carrying a stray puppy with him all the time. The monkey climbs walls holding the puppy in his arm, he walks along the streets, rests on the pavement and even eats with the little pup. One would have imagined that the puppy is a plaything for the monkey. But those who have seen the monkey and the dog together for days don’t have any doubt that the monkey has adopted the dog. There are images available on social media that show the monkey actually being the parent of the pup. This is surprising because monkeys and dogs generally don’t gel well. Monkeys have been known to tease dogs and dogs have been rather noisy with their apparent attacks on monkeys, which never culminate to violence, though. The two species have been at odds.